Did you know that you can hire bee removal beekeepers that won’t use poisons? There’s no need to reach for a can of toxic nastiness and attempt to spray away nuisance stinging insects (and probably get stung in the process). And, you don’t have to hire a pesticide applicator to do the nasty job for you either. Besides, they’ll leave behind toxic residues (and possibly a still-active nest as well). In fact, there are a number of experienced beekeepers for hire who will do bee removals of all kinds without pesticides. Corky of BuzzBeeGone.com & Ballard Bee Company assessing an aerial honeybee swarm before he begins gently removing them to relocate into a productive apiary. Bumblebees: If bumblebees have nested in a corner of your garden that doesn’t get high traffic, just leave them alone and be thankful they’ve taken up residence for their brief pollinating season. They aren’t aggressive if you leave them alone. Plus, your garden will benefit from their good works. And, when the season has ended, they won’t return to the same spot the following year. If they have nested in the ground and you have them extracted, they may not survive the move. If they’ve taken up residence in an old birdhouse as happened in the rose garden of one of our co-horts, someone like me might just adopt them if you can’t find you’re able to co-exist with them (as happened to said co-hort who was sad to see them go.) In fact, I’m marking adoption sites in my garden now so the pros can drop off your unwanted bumblers. 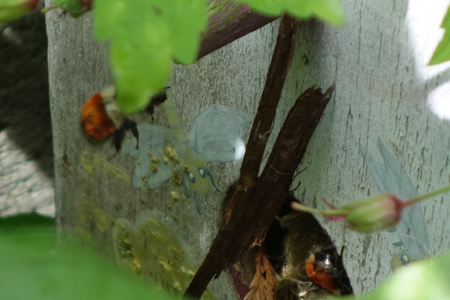 Orange-rumped bumblebee returning to its nest inside a birdhouse. Honeybees: If you aren’t a honeybee keeper, you may not want a swarm of honeybees to move into the cavity of a hollow tree in your garden or the inside of your bar-b-que. Well, actually, even if you are a beekeeper, you probably wouldn’t want them in those spots. 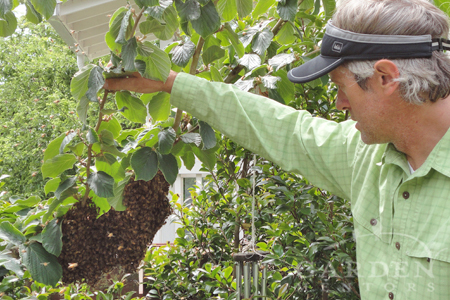 Fortunately, professional bee extractors will often remove open-air honeybee swarms without fee, and whenever possible, they’ll put that swarm to good work in their apiaries. 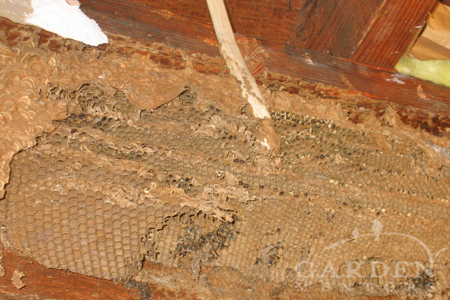 If the honeybees have moved into the walls of your home or other tricky spots, there may be costs involved in the extraction. Paper Wasps & Hornets: This is a pretty big group, but in general, these are the varieties that build open-faced papery nests in places like the eaves of your front porch. And, some create those big cyclone looking papery nests. Some will dwell in the ground, too. Some are very aggressive while many are very docile (until you start spraying the nest or poking it with a stick.) While hornets and wasps do have beneficial purposes, you may not want them building a fortress to defend right outside your front door. This happened to one of our clients. The hornets had, in fact, found their way into the inside of the false ceiling of their front porch where it was nice and cozy for winter, and they were not nice at all to anyone who came to the front door. 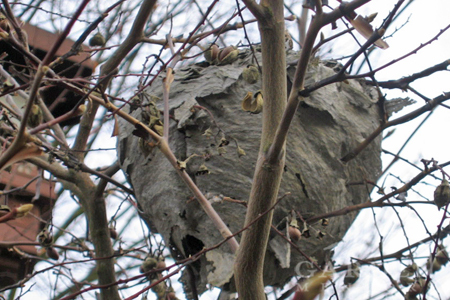 This aerial hornet nest went unnoticed in a public park until leaves had dropped & the nest was abandoned in winter. Left alone, hornets aren’t aggressive & do good garden works! Giant bees in early spring: In late winter/early spring, you may see solitary, giant versions of all kinds of bees stumbling out of mulch piles, chewing on garden wood, or even showing up inside your bedroom. These giants are likely queens that have overwintered and are waking up to start their colonies for the coming season. One March one of our co-horts found several giant yellow jacket queens had awoken inside her master bedroom. Her son has a severe allergy to yellow jackets, so they called in a local poison-free bee extractor who removed the unwelcome, potentially lethal ladies without incident. Dispatching with queens before they start up a colony is another way to keep unwanted bees at bay. 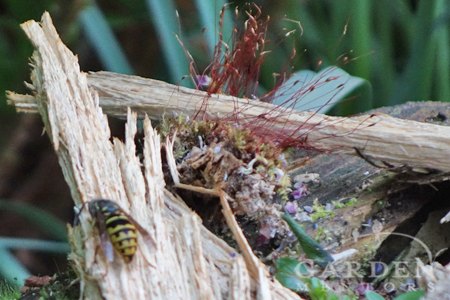 Huge yellow jacket queen gnawing on a beneficial garden nurse log in early spring. She uses the wood pulp to begin building her nest for brood. Why not just douse the nests with pesticide or drown them at night? Okay, first off: yuck! Just don’t go to a spray bottle as your first line of defense for anything; it’s toxic. That’s why it kills things. And, often, spraying nests just doesn’t work — whether you try drowning a nest in water or douse it with pesticide. A few years ago my neighbor attempted to kill off a yellow jacket nest under his deck, outside his bedroom door. Rather than eradicate the nest, he managed to split it, get stung badly, and part of the nest stayed active in the same spot. The rest moved into a large container filled with plants on my patio where it thrived. Because the container was adjacent to our garage door, I tried to drown the hive by inserting a hose into the container and running it all night, a few times. The container was well flooded, but the hive continued to thrive. Finally, we gave up, knowing the nest wouldn’t last past the coming winter. We just changed our travel habits near the nest when it was highly active, giving it a wide berth. We left them alone, and they left use alone too. What about sealing up the entry to a hive to kill them? Probably not going to work. The bees will go to work finding or building a new exit, and if that hive has been built into the walls of your house, their exit may be into the interior of your home as happened to a friend of mine last spring when queen yellow jackets began emerging to start their colonies for the season. Fortunately, she was able to hire a professional beekeeper to extract the 5-6 queens that were buzzing around her master bedroom, looking for a way out. During a remodel we found a wall “insulated” by a long-abandoned wasp nest predating us. So, who can you hire? Seattle: Dan the Bee Man. Not only does Dan do extractions, but Dan’s brought us unwanted bumblebees in the past. If you are outside these areas, contact your local beekeeping associations or agriculture extension office for local referrals to the right poison-free bee removal service near you. If you happen to offer poison-free bee removal services outside the Seattle area, leave a comment below to help folks in your area find you. I’ve actually got a large nest of bees that showed up in my yard not too long ago. The last thing I want is to nuke the hive with pesticides, but I also don’t want to leave them there because I have a son that enjoys playing in the yard. If anything, I’d much prefer to have a professional come to remove and relocate them for me. Trying to drown the hive definitely does not work! My mom tried that several years ago and ended up with some nasty stings. She ran in the house and brought a few of the bees in with her! Better to just have a professional handle it, especially if you have children around. I would rather just have someone come and get rid of the bees rather than try and do it myself! I would hate to get stung and cause even more problems! I don’t like the idea of creating angry bees or wasps. Honey bees, Mason bees, & Bumble bees in Northeast Ohio. I went to start getting my garden ready last weekend, and there was a huge bee hive back there. Honestly, I have no idea what kind they are, if they are bumblebees or honeybees. Either way though, I need to hire someone to come take care of them for me, to move them somewhere where they won’t be such a bothersome. My husband and I have a huge nest of bees by our garage door and we’re hoping to find a great removal service before one of our kids gets stung. So thank you for mentioning that a lot of extractors may actually take them away for free since they can use them in their apiaries. We’ll still be looking for a professional bee removal service since we’re fairly sure they’re not honeybees, but we’ll definitely keep that in mind for the future.